US studio Walker Warner Architects has created a trio of pavilions at a California winery with operable glass walls that enable tasting rooms to be fully open to the outdoors. The Quintessa Pavilions are located within the Quintessa Estate Winery, which covers 280 acres (113 hectares) in Napa Valley. 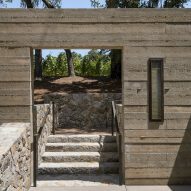 San Francisco-based Walker Warner Architects had designed the winery's original estate back in 2003, and was recently brought in to create a series of pavilions that would provide an immersive wine-tasting experience within the picturesque landscape. The three structures, each measuring 250 square feet (23 square metres), are situated on a ridgeline and offer sweeping views of the vineyards. The pavilions are meant to exemplify a fusion of architecture and nature, while also referencing the winery's existing buildings. "Each pavilion reflects Quintessa's desire for architecture that harmonises with the natural surroundings of the property," the firm said. "The overall design echoes the existing winery with an industrial material palette that ages and weathers elegantly." The rectilinear pavilions are composed of dark steel frames, textured concrete walls and large panes of glass that can be swung open. 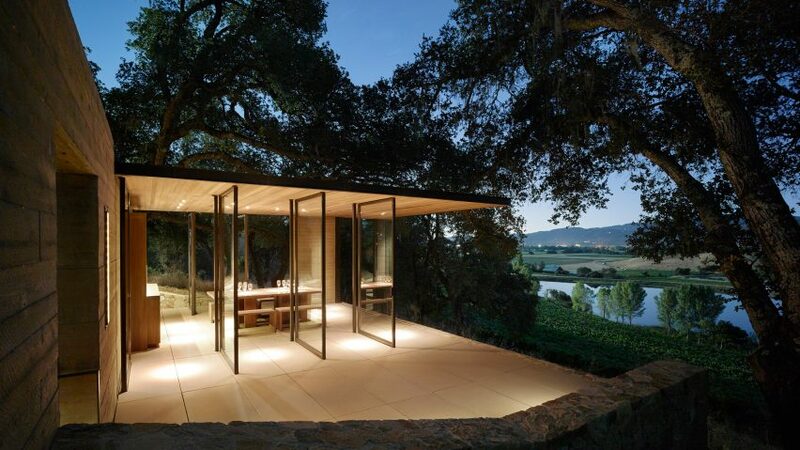 In one pavilion, an entire glass wall slides to the side, enabling the tasting room to be fully open to the outdoors. "Expansive walls of operable doors help to maximise the openness for light, views and cross ventilation," the studio said. Flat roofs extend far beyond the exterior walls, offering protection from the sun and rain – and helping ensure the pavilions can be used year-round. Locally sourced materials were incorporated where possible, such as stones for retaining walls and concrete pavers for the flooring. Ceilings are sheathed in "sinker cypress", which comes from logs reclaimed from river bottoms. Chosen for its durability and warmth, the same wood was used for the pavilions' casework. African teak certified by the Forest Stewardship Council (FSC) was used to fabricate custom furnishings. The pavilions were sited in a way that preserved existing oak trees, while indigenous grasses were used for landscaping around the structures. 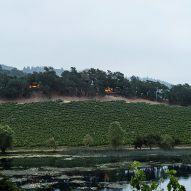 "The surrounding plantings are drought-resistant native grasses intended to soften the transition from the pavilions to the vineyards," the team said. The project recently won a design award from the San Francisco chapter of the American Institute of Architects. Other American winery projects include an Oregon tasting room by Lever Architecture with walls made of cedar and glass, and a small complex for a Washington winery by GoCstudio that has a subtle profile and earthy material palette.